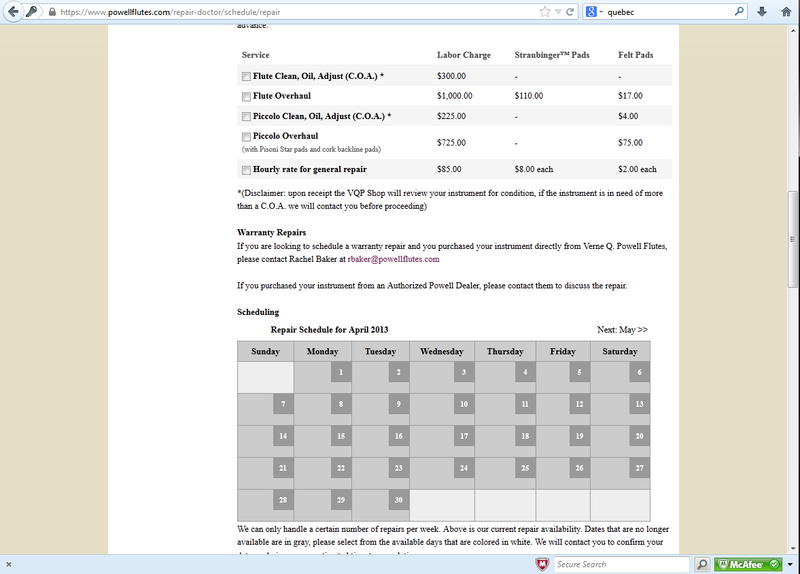 Did you know that you can schedule your repair directly from the Powell website? If you haven't taken advantage of this very convenient option, you might want to try it the next time your flute needs repair. 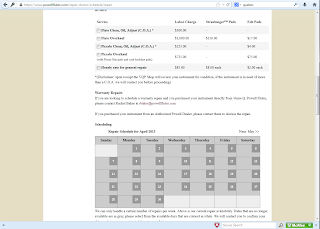 The form is very user-friendly, and you can even choose the date you prefer on the calendar feature. If you don't have a Powell flute, that is okay -- any flute can be sent in for repair here at Powell. 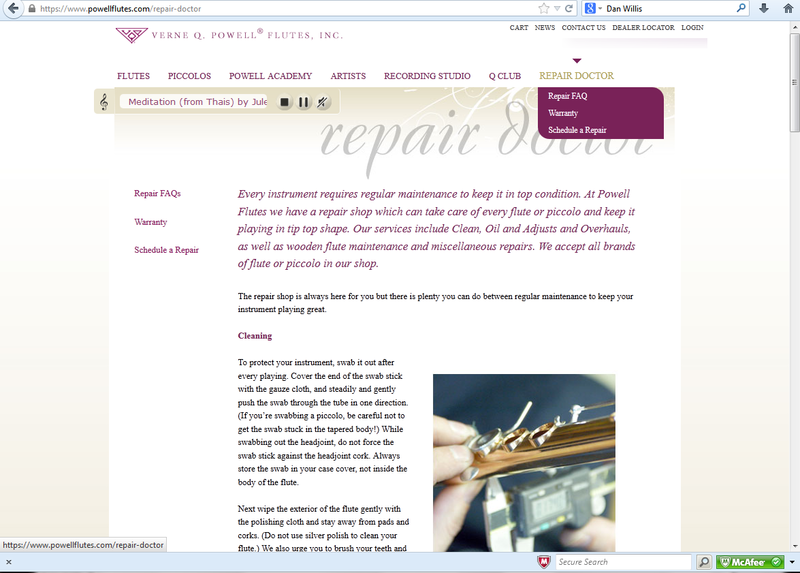 To get started, you'll want to go to our main webpage at www.powellflutes.com. 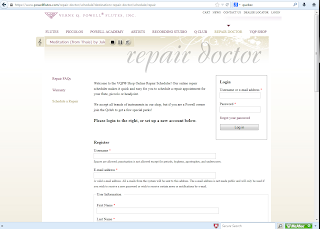 In the upper right-hand corner of the page, hover over "Repair Doctor" with your mouse, and you will see a drop down menu with the option to "Schedule a Repair." Click on "Schedule a Repair." 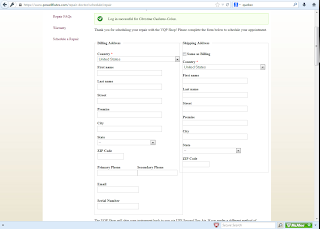 You'll need to log in to your account from here, and you can create an account if you do not already have one. 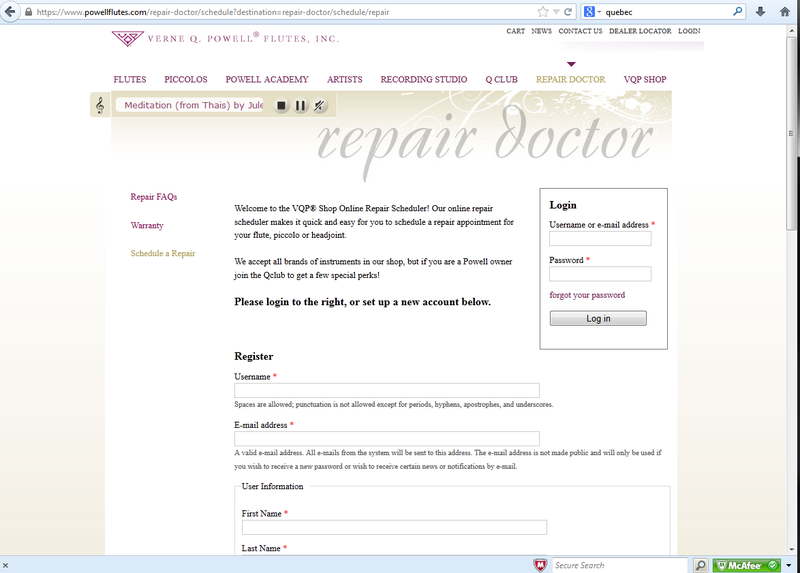 Once you are logged in, you'll see the online repair form. It's pretty straighforward and simple to complete. You'll see prices for the services, and you'll also be able to choose a preferred date for service. If the date you choose is unavailable, a message will appear on the calendar. You can also add additional notes for our technician if there are specific items that need attention on your flute. 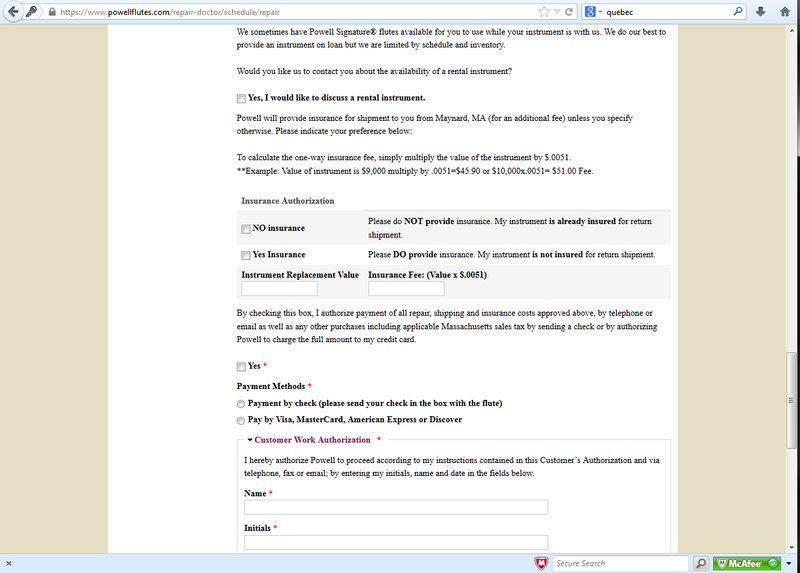 Another option that you'll see on the form is a "rental instrument" to use while your flute is in the shop. This is actually more of a "loaner flute" since Powell does not charge a rental fee for this instrument. Most "loaner flutes" from Powell would be Signature flutes and sometimes Conservatory flutes. A 2100 or 3100 may also be available as a loaner. This is a nice option if you do not have a spare or back-up flute. A C.O.A. will take about 2 weeks, and an overhaul will take 4 weeks -- so a loaner would certainly help out if you need one. Our repair technician, Rachel, also reminded us that the day you request on the calendar for your repair is the day that the repair would begin -- so you'll definitely want to plan accordingly. The schedule is closed during around the time of the NFA conference in August and also for one week in early July when our shop is closed for a summer break. 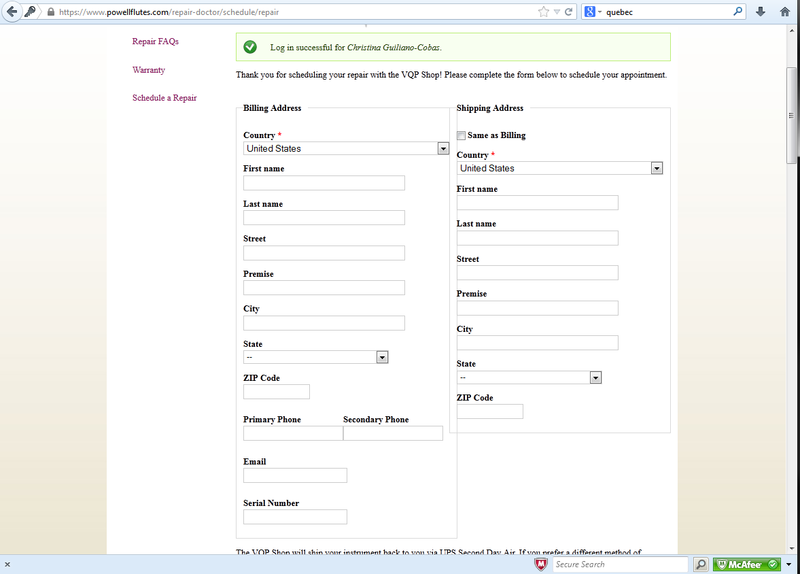 We do hope that you'll consider using the online form to schedule your repair. It's quick and easy, and your form goes directly to the repair technician. Also, one nice perk is that you will receive a 5% discount on accessory orders from the VQP shop when you schedule your repair. Once your repair form is submitted, you'll get a confirmation e-mail with the discount code -- so feel free to take advantage of that. Rachel says that she's happy to help get the accessories you order together and send them back with your freshly repaired flute! 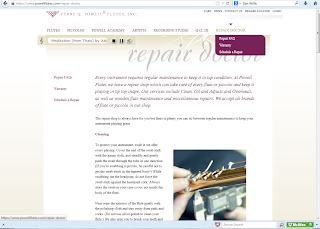 Give it a try at https://www.powellflutes.com/repair-doctor/schedule?destination=repair-doctor/schedule/repair. First screen to start the process. Next screen after "Schedule a Repair" is selected. Once you are logged in, you'll see this screen. List of prices and the calendar. 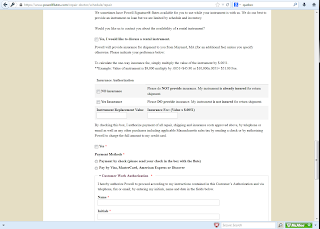 Area on form to select "rental" flute.